Come join us for an incredible journey on the Hackensack River, through the marshes of the New Jersey Meadowlands, and more! Eco-Cruises are fun, educational tours aboard Hackensack Riverkeeper’s specially rigged 30-foot pontoon boats, the r/v Robert H. Boyle II and the r/v Geraldine Theresa. Captain Bill Sheehan started Eco-Cruises in 1994 to increase awareness of the lower Hackensack River as a vital natural and recreational resource. Since then more than 50,000 people have traveled with us. Most Eco-Cruises include 2 ½ hours on the water and are fully narrated by either Capt. Bill or Program Director Capt. Hugh Carola – both of whom are US Coast Guard-licensed captains. in advance (see list below) and open to individuals, couples & families. Itineraries include Meadowlands Discovery, Boating Thru Bergen and Newark Bay Excursion. To reserve seats, call Capt. Hugh at 201-968-0808. Open trips are not available for group outings. (12 persons max per boat) and Youth Charters (up to 15 persons max per boat) can booked for the itinerary of your choice. Call Hugh to book. Combination Environmental Education programs can be arranged for school, Scout and camp groups of up to 30 persons. “Combos” include a pair of 1.5-hour Eco- Cruises backed with age-appropriate landside activities over a 3-4 hour period. Call Capt. Hugh for more details. PLEASE NOTE: Hackensack Riverkeeper does not sell tickets, charge fees or require monetary consideration as a “Condition of Carriage” for Eco-Cruise participation. If you choose to make a donation (and we hope you do) 100% of your donation supports Riverkeeper’s mission to protect, preserve and restore the Hackensack River – and is 100% tax-deductible. Call Capt. Hugh for further information. MEADOWLANDS DISCOVERY (M) – This trip takes participants on an excursion through the lower tidal reaches of the Hackensack River and its wildlife-rich estuary, the Meadowlands. The shallow draft of our boats enables us to visit numerous wetlands including the Mill Creek Marsh, Kingsland Creek and the Berry’s Creek Canal; but the highlight of every Meadowlands Eco-Cruise is a trip through the Sawmill Creek Wildlife Management Area – the “Jewel of the Meadowlands”. The Sawmill WMA is home to a staggering amount of wildlife including shorebirds, waterfowl, herons, raptors, muskrats and terrapins. BOATING THROUGH BERGEN (B) – Join us for a trip up the Hackensack River from the southern Meadowlands to heart of the city of Hackensack. Taking the route once traveled by the coastal schooners and steamers that carried cargo to and from Bergen County, we will pass the ruins of their former docks and landings and discuss the region’s all-but-forgotten maritime history. Before turning back, we will travel upriver to the Court Street Bridge and offer participants an opportunity to get an up-close view of the USS Ling – a World War II Balao-class submarine and centerpiece of the New Jersey Naval Museum. EXCURSION AROUND THE BAY (E) – This trip will take you down the Hackensack River, the entire length of Newark Bay to Staten Island and back to explore this integral part of New York Harbor. Among other sights, we will pass Kearny Point, the former site of Federal Shipbuilding & Drydock Co., where hundreds of warships, Liberty and Victory ships were built during the Second World War; and the busy port facilities of Ports Newark and Elizabeth with ocean-going cargo vessels being loaded and unloaded. On the way back upriver we explore the Bayonne bayshore, home to numerous parks and historic sites. For more information, or to book an Eco-Cruise or Combo program, call Captain Hugh Carola at 201-968-0808. Upon reserving, directions and trip tips will be mailed (or e-mailed) to you. PLEASE NOTE: Regardless of itinerary or type of Eco-Cruise, we endeavor to provide the best on-water experience possible while relating the natural and human history of the region. 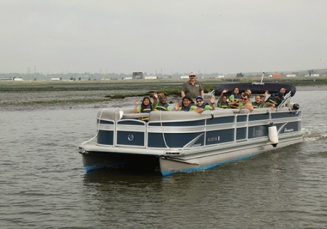 At the present time, ALL scheduled OPEN Eco-Cruises leave from Laurel Hill County Park in Secaucus, NJ. Most group CHARTER Eco-Cruises also leave from Laurel Hill but CAN be arranged to leave from the marina at River Barge Park in Carlstadt, NJ.